It is lady beetle season here. There are dozens of the larvae in our garden, so we collected some up and have been watching them, and feeding them aphids and mealy bugs. 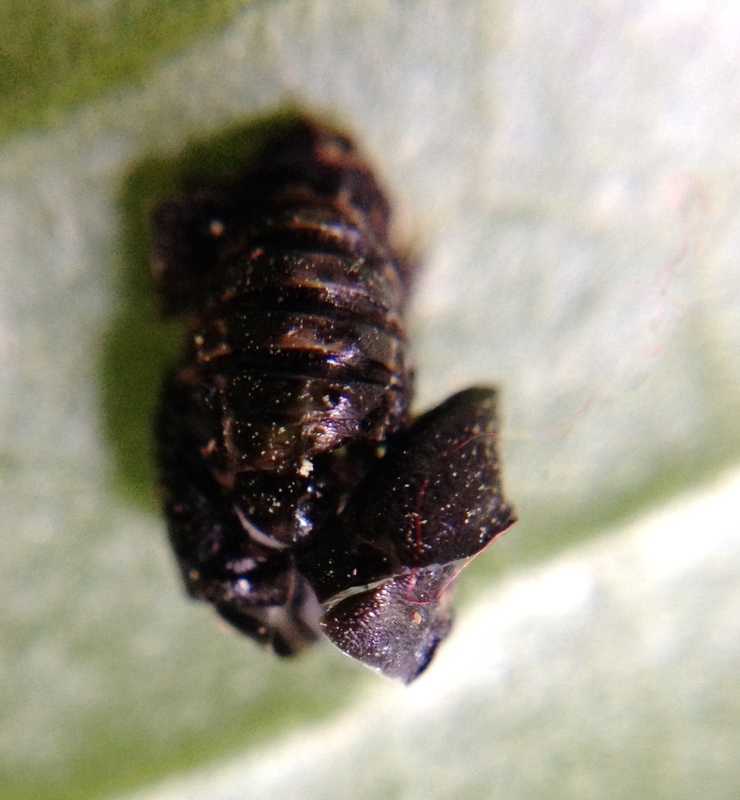 The larvae moult several times, getting larger each time. We weren’t sure what species they would be. We didn’t find any kind of overview with information about the species that are in NZ, which are both native and introduced. 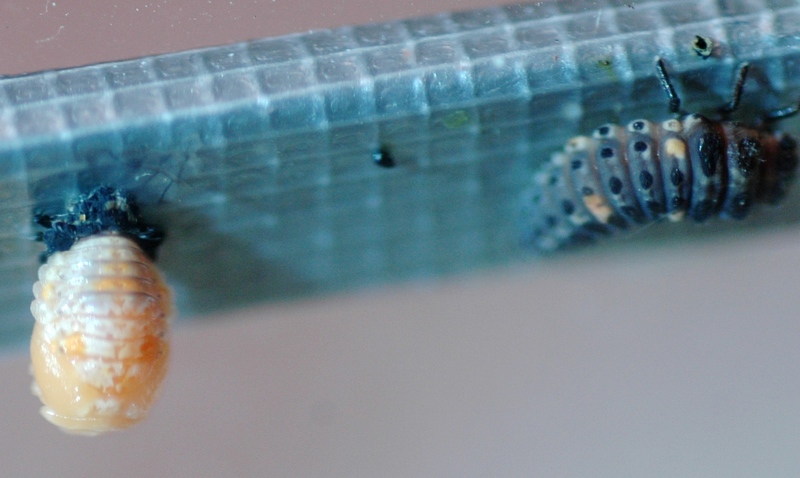 It is especially difficult to find information about the larval stage. After a couple of days, the first few larvae started to pupate. 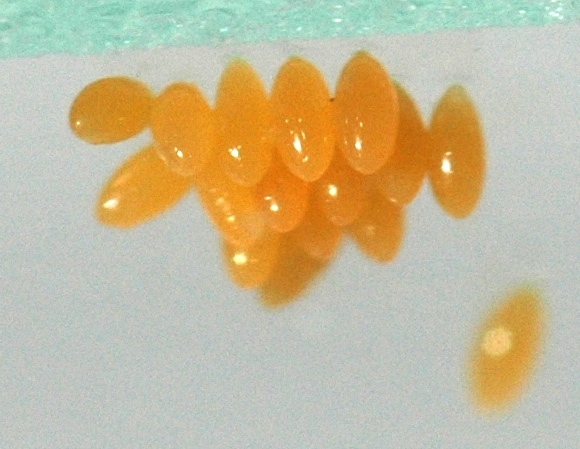 The pupa was a yellowy colour, later becoming much darker – almost black. 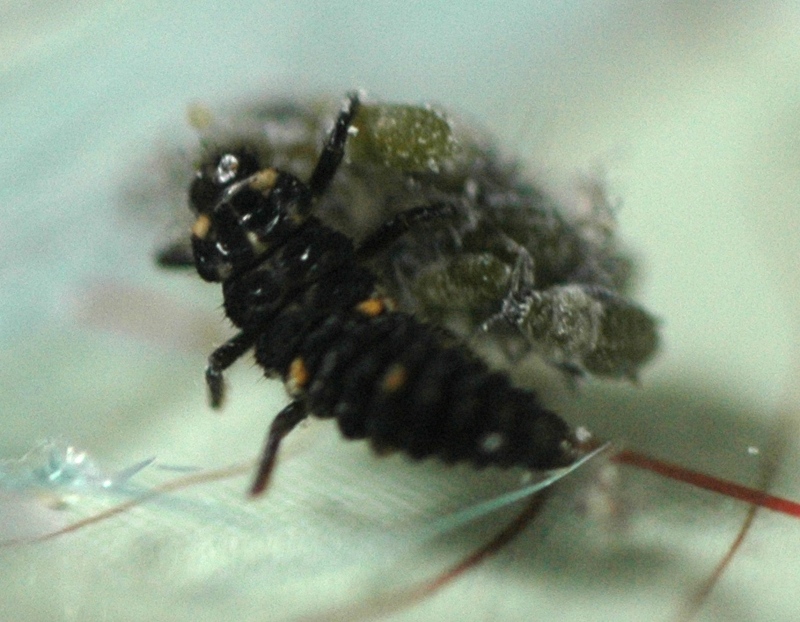 One evening, about a week later, the first beetle hatched. At this stage it was a pale cream colour. By the morning it had turned the classic red and had two black spots. So probably, we have Adalia punctata. We now have about 8 beetles, apparently all of the same species. We have since found a little more information, including this paper here. There is also information on the Coccinellidae family on Wikipedia. The beetles don’t seem to be quite so keen on the mealy bugs, but are enthusiastic about the aphids. And we now have several bright orange clusters of lady beetle eggs. Quite a few clusters of eggs were laid, but also quite a few of those were eaten by the beetles themselves. 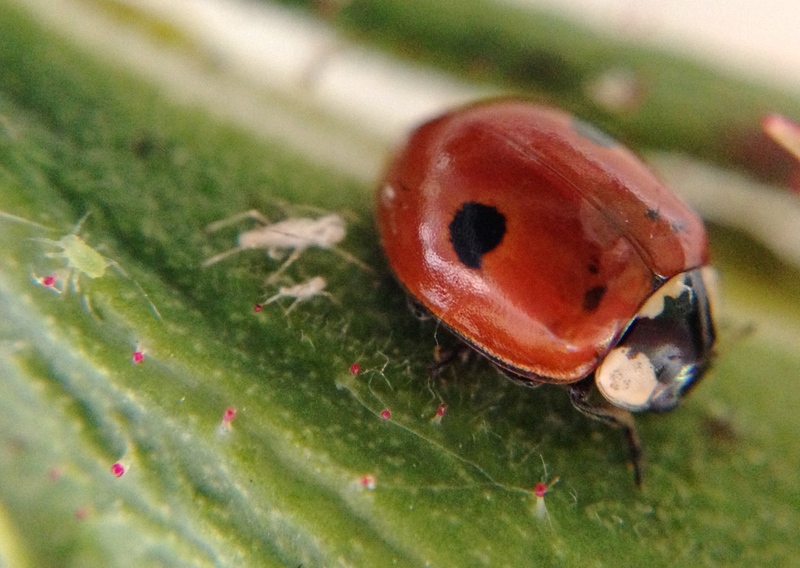 Lady beetles are described as ‘voracious’ feeders, with some eating 1000 aphids in a life time. The whole life cycle was quite quick and we can recommend these as a species to try, if you would like to keep some insect pets. Life cycle of the 2-spotted lady beetle. A, the adult beetle. 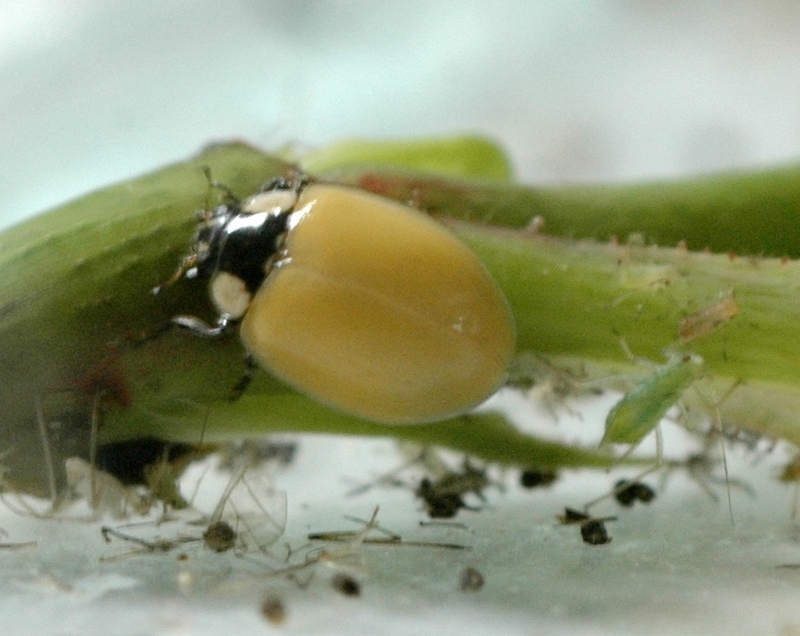 B, group of eggs on under surface of a leaf. 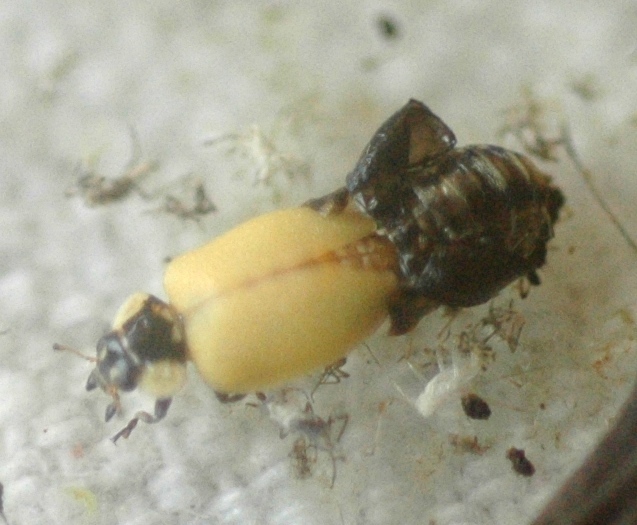 C, a young larval beetle covered with white wax.